George Stephenson (9 June 1781 – 12 August 1848) was an English civil engineer and mechanical engineer who built the first public railway line in the world to use steam locomotives, and he is renowned as being the "Father of Railways". The Victorians considered him a great example of diligent application and thirst for improvement, with self-help advocate Samuel Smiles particularly praising his achievements. His rail gauge of 4 feet 8½ inches (1,435 mm), sometimes called "Stephenson gauge", is the world's standard gauge. Son of a coal-mine mechanic, he himself became chief mechanic at a coal mine, where his interest in steam engines led to experiments on a machine to pull coal-filled cars out of the mines. In 1815 he devised a powerful “steam blast” system that made the locomotive practical. In 1825 he built a steam locomotive for the first passenger railway, from Stockton to Darlington, which could carry 450 people at 15 mph (24 km/hr). In 1829, assisted by his son Robert Stephenson, he built his improved locomotive, the Rocket, which won a speed competition at 36 mph (58 km/hr) and became the model for later locomotives. His company built all eight locomotives for the new Liverpool-Manchester railway (1830). 1830 also saw the grand opening of the skew bridge in Rainhill. The bridge was the first to cross a railway at an angle. This required the structure to be constructed as two flat planes (overlapping in this case by 6') between which the stonework forms a parallelogram shape when viewed from above. This has the effect of flattening the arch and the solution is to lay the bricks forming the arch at an angle to the abutments (the piers on which the arches rest). This technique, which results in a spiral effect in the arch masonry, provides extra strength in the arch to compensate for the angled abutments. The next ten years were the busiest of Stephenson’s life, as he was besieged with requests from railway promoters. Many of the first American railroad builders came to Newcastle to learn from Stephenson, and indeed, the first dozen or so locomotives utilized in the U.S. were purchased from the Stephenson shops. Other talented men were starting to make their marks, such as his son Robert, his pupil Joseph Locke and finally Isambard Kingdom Brunel. His conservative views on the capabilities of locomotives meant that he favoured circuitous routes and civil engineering that were more costly than his successors thought necessary. For example, rather than the West Coast Main Line taking the direct route favoured by Joseph Locke over Shap between Lancaster and Carlisle, Stephenson was in favour of a longer sea-level route via Ulverston and Whitehaven. Locke's route was the one built. Stephenson also tended to be more casual in estimating costs and paperwork in general. He worked with Joseph Locke on the Grand Junction Railway with one half of the line allocated to each man. Stephenson’s estimates and organising ability proved to be inferior to those of Locke and the board’s dis-satisfaction led to Stephenson’s resignation. This caused a rift between Stephenson and Locke, which was never healed. Despite Stephenson's losing some routes to competitors due to his caution, he was offered more work than he could cope with, and was unable to decline offers for additional work. He worked on the North Midland line from Derby to Leeds, the York and North Midland line from Normanton to York, the Manchester and Leeds, the Birmingham and Derby, the Sheffield and Rotherham among many others. Stephenson tended to become a reassuring name, rather than a cutting-edge technical adviser. He was the first president of the Institution of Mechanical Engineers on its formation in 1847. He had by this time settled into semi-retirement, supervising his mining interests in Derbyshire - tunnelling work for the North Midland Railway had revealed unworked coal seams, and Stephenson put much of his money into their exploitation. George first courted Elizabeth (Betty) Hindmarsh, a farmer's daughter from Black Callerton, whom he would meet secretly in her orchard. Her father Thomas refused marriage because of Stephenson's lowly status as a miner. George next paid attention to Anne Henderson where he lodged with her family, but when she also rejected him he transferred his attentions to her sister Frances (Fanny), who was nine years his senior. George and Fanny married at Newburn Church on 28 November 1802. They had two children Robert (1803) and Fanny (1805) but the girl died within weeks, and George's wife died, probably of consumption, the year after. While George was away working in Scotland, Robert was brought up by a succession of neighbours and then by George's unmarried sister Eleanor (Nelly), who continued living with them in Killingworth on George's return. On 29 March 1820, George (now considerably wealthier) was finally allowed to marry Betty Hindmarsh at Newburn. The marriage seems to have been a happy one, but there were no children from this union, and Betty died in 1845. On 11 January 1848, at St John's Church in Shrewsbury, George married for the third time, to Ellen Gregory, another farmer's daughter originally from Bakewell in Derbyshire, who had been his housekeeper. Six months after his wedding, George contracted pleurisy and died, aged 67, on 12 August 1848 at Tapton House in Chesterfield, Derbyshire. He was buried at Holy Trinity Church, Chesterfield, alongside his second wife. - Robert was born on 16 October 1803 and married Frances Sanderson, daughter of a City of London professional John Sanderson, on 17 June 1829. Robert died in 1859 having no children. - His daughter was born in 1805 but died within weeks of her birth. Britain led the world in the development of railways and this acted as a stimulus for the industrial revolution, by facilitating the transport of raw materials and manufactured goods. George Stephenson cannot claim to have invented the locomotive. Richard Trevithick deserves that credit. George Stephenson, with his work on the Stockton and Darlington Railway and the Liverpool and Manchester Railway, paved the way for the railway engineers who were to follow, such as his son Robert, his assistant Joseph Locke who went on to carry out much work on his own account and Isambard Kingdom Brunel. These men were following in his footsteps. Stephenson was also farsighted in realising that the individual lines being built would eventually join together, and would need to have the same gauge. The standard gauge used throughout much of the world is due to him. George Stephenson's Birthplace is an 18th century historic house museum in the village of Wylam, and is operated by the National Trust . The museum in Chesterfield, Derbyshire has a room full of Stephenson memorabilia, including the straight thick glass tubes that he invented for the purpose of growing straight cucumbers. George Stephenson College, founded in 2001 on the University of Durham's Queen's Campus in Stockton-on-Tees, is named after him, with the student union bar being named The Rocket. Also named after him and his son is George Stephenson High School in Killingworth, the Stephenson Railway Museum in North Shields and the Stephenson Locomotive Society. The Stephenson Centre, an SEBD Unit of Beaumont Hill School in Darlington, is also named after George Stephenson. As a tribute to his life and works, a bronze statue of Stephenson was unveiled at Chesterfield railway station (which is overlooked by Tapton House, where Stephenson spent the last ten years of his life) on 28 October 2005, marking the completion of improvements to the station. At the event a full-size working replica of the Rocket (Also known as the Bullet) was on show, which then spent two days on public display at the Chesterfield Market Festival. A statue of George dressed in classical robes stands in Neville Street, Newcastle, facing the building that houses the Literary and Philosophical Society and the Mining Institute, and near to Newcastle railway station. From 1990 until 2003, Stephenson's portrait appeared on the reverse of Series E £5 notes issued by the Bank of England. Stephenson's face is shown alongside an engraving of his Rocket steam engine and the Skerne Bridge on the Stockton to Darlington Railway. His image was replaced in 2003 by that of Elizabeth Fry. 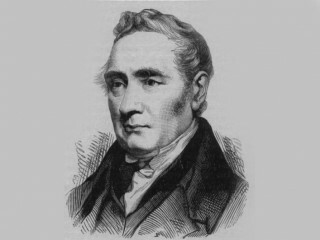 View the full website biography of George Stephenson.